Lansdale's freight station prior to rehabilitation work. Lansdale, Pennsylvania, a small town situated 28 miles north of Philadelphia, is home to two historic train stations. One is the beloved Lansdale passenger station, a brick building constructed in 1903. Passengers flow through it like water; it remains one of the busiest commuter stations in Philadelphia’s transportation system. Because of its high visibility, there were few complaints when it came time for repairs in 1999. The station’s rotted roof was replaced and its windows and doors were patched up, leaving it looking like its early-20th century self. But less than two blocks away lies its counterpart, a stone freight station that Bill Henning, vice president of the nonprofit Discover Lansdale, calls “the ignored stepchild” of the pair. Also built in 1903, the freight station spent decades as Lansdale’s commercial heart before falling vacant for over 20 years. 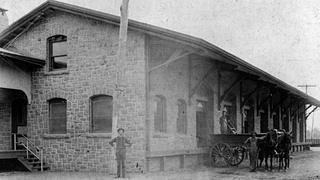 An undated historic photo of Lansdale's freight station. 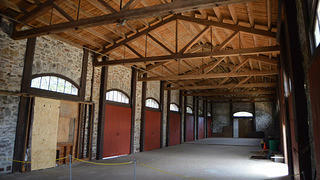 The freight station's overhangs were destroyed in the late 1990s, allowing the elements to damage the floor joists. For a town once defined by its status as a railway junction, the stations embody the essence of its history, especially the freight station. The North Pennsylvania Railroad founded Lansdale in 1872 to accommodate the railway they had built through the area several years prior. They selected its location based on its relation to other large towns; from Lansdale, trains could travel west to Reading, north to Allentown and Bethlehem, and south to Philadelphia. What began as a miniscule community blossomed into a thriving small town. Farm equipment manufacturers, hosiery mills, grain mills, and steel plants all sprang up to take advantage of Lansdale’s prime location, giving the town a diversified economy that proved capable of withstanding major recessions. And for all of these companies, the freight station served as their point of dispatch. However, the arrival of the truck as the primary method of transporting goods dealt a severe blow to many railroad companies, and the North Pennsylvania Railroad was no exception. 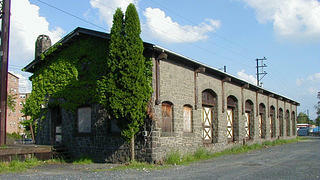 The company sold Lansdale’s freight station in the late 1970s, leaving one of the town’s most significant structures without a use. An attempt was made to convert it into an auto body shop, but by the time the new millennium rolled around, the shop had folded and the station vacated. It remained that way until 2016, when the station came to the attention of Bill Henning and Discover Lansdale. The nonprofit, which works to promote events and businesses in town, recognized the significance of the station to Lansdale’s history, and saw the need for a multipurpose space and visitor’s center. They convinced the borough parking authority to purchase the station and its surrounding land, and then sell the structure to Discover Lansdale for $60,000. (The parking authority only wanted the space to create a new lot). The station's pine flooring had to be removed to access the joists. Volunteers have played a crucial role in minimizing the costs of the project. To Henning’s surprise, a survey determined that much of the structure was in remarkably good shape—the stone walls and roof had endured for a century with minimal damage. But the floor joists underneath the freight doors had rotted from rain and snow, rendering them unstable. In addition, electricity and plumbing needed to be installed before the building could open to the public. All told, the rehabilitation project was estimated to cost $250,000. Discover Lansdale has raised around $70,000 thus far through private donations and by selling the station’s original yellow pine flooring (which needed to be removed to repair the joists underneath) to people looking for quality wood to build benches and bookcases out of. But equally beneficial to the bottom line has been the support of the community. 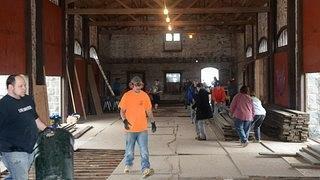 The project’s engineer and electrician have provided work for free or at discounted rates, a local tavern raised $5,000 for the rehabilitation by hosting a beer garden in the station’s parking lot for two summers, and Lansdale residents have come out in droves for the clean-up days that Discover Lansdale has organized. However, Lansdale’s difficult history with historic buildings has likely played as much of a role in mobilizing the town. The Hotel Tremont opened in 1890 and eventually became the town’s finest restaurant, drawing customers from throughout the Philadelphia metro area. Meanwhile, the Lansdale Theatre became its most beloved entertainment venue. Both were met by the wrecking ball, in 1997 and 1979, respectively. The loss of the Lansdale Theatre particularly stung. Soon after it was demolished, similar single-screen theaters in nearby towns were converted into multipurpose event spaces—exactly the kind of space Discover Lansdale envisions for the freight station. If volunteer turnout has been any indication, the freight station won’t be going anywhere. 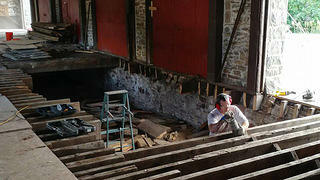 Work has already begun on its new floor, and will resume once the snow and cold weather subsides. Though much fundraising remains, Henning is optimistic that the building will be open to the public by the end of 2018. All signs point toward a successful rehabilitation, and the preservation of a key link to Lansdale’s past.